This segment comes from Episode 2: Rights + Wrongs. Modern Westerners take it for granted that every life is valuable. But ideas like equality before the law and the importance of caring for the vulnerable are by no means self-evident. So where did they come from? Why are we so attached to the idea of “inalienable human rights”? This segment looks at how William Wilberforce’s belief that humanity is made in the “image of God” led him to campaign tirelessly for the abolition of the slave trade, and in doing so, change the course of history. William Wilberforce’s campaign to abolish the slave trade changed the course of history. SIMON SMART: The abolitionist movement in the United States owed a debt to what had taken place earlier in Britain – in particular, to the herculean efforts of one British parliamentarian, who was inspired by the same Christian vision of humanity. This is the house of William Pitt the Younger, Prime Minister of Great Britain in the late 18th and early 19th centuries. On May the 12th, 1787, Pitt was visited here by his close friend, William Wilberforce. Wilberforce was a fellow politician, who’d been wrestling with a thorny issue that would become one of the most momentous pieces of legislation ever brought before the British parliament. And Wilberforce’s diary records the events of the day. He says, “I well remember after a conversation with Mr. Pitt, in the open air at the root of an old tree at Holwood …” (That tree used to stand right there, they’ve replaced it with a new one) “… I resolved to give notice on a fit occasion in the House of Commons of my intention to bring forward the abolition of the slave-trade”. Wilberforce had set his foot on a path that would see him spend the next twenty years in a battle to end the slave trade in Britain and her colonies. It would take another 26 years to achieve the end of slavery itself throughout the empire. ERIC METAXAS: William Wilberforce is one of these figures from history that when you find out what it is that he did, if you didn’t know before, you’re embarrassed, and it’s a strange, strange thing. He’s one of the most important figures in history, there’s no question about it. SIMON SMART: Wilberforce converted to Christianity in his mid-20s, and with his new-found faith came a passionate commitment to action on behalf of others. He became a leader of the “Clapham Sect”, a network of friends and families living here in Clapham, who made it their life’s mission to support the vulnerable and the poor. And there were plenty of them in 19th century Britain. In fact, Wilberforce was the linchpin of 69 voluntary societies. He and his friends worked on an astonishing number of projects: improving conditions for children in cotton mills, prison reform, public education, hospitals for the poor. But it was the battle to abolish slavery for which Wilberforce became best known. ALISTER MCGRATH: The problem was that for many people in England slavery was economically productive and valuable. And so, it required a major challenge on ethical grounds for this to be declared to be improper. And the point I’d want to make is that religion provided that framework – these people all bear the image of God, we cannot commodify them. That was a really important theological challenge which went beyond utilitarianism. SIMON SMART: Wilberforce’s motivation came from his conviction that all people shared a common humanity, whether kings or servants, princes or peasants. Slavery was a disgrace to Britain and a stain on the soul of humanity. It had to be abolished. This wasn’t just about reforming the way slavery was carried out, but eradicating it altogether. And it’s easy to underestimate just how hard it was to convince people that ending slavery was a good thing. There was huge opposition to the idea, and at one point, Wilberforce was up against most of the Cabinet, the Lord Chancellor, the Secretary of State, Admiral Lord Nelson, even the Royal Family. And of course, there were powerful commercial interests that viewed slavery as necessary to the nation’s prosperity. There was also a radical shift in thinking required to see slavery as morally wrong. It was simply part of the fabric of society, and Wilberforce and his widening circle were out of step with their more “rational” countrymen. ROWAN WILLIAMS: In the Middle Ages, you have the beginnings of a real theoretical assault on the notion of slavery. You have the recognition in the 12th century that there are aspects of human life that cannot be controlled by any other. And by the 18th century, of course, you have the great anti-slavery movement which is almost entirely the church’s business. If the abolition of slavery had been left to enlightened secularists in the 18th century we’d still be waiting. SIMON SMART: Wilberforce was friends with Josiah Wedgwood, the famous manufacturer of bone china. The design was widely popular. It was incorporated into plates, jugs, tea caddies, bracelets, and hairpins, much the same way wristbands or ribbons are worn today to signal support of a cause. We all know that you’re not supposed to bring up politics or religion at dinner parties. But Wedgwood had galvanised a potent force for the cause – the housewives of England. Women were the main food purchasers in every household, and they played an important role in boycotting sugar grown on slave plantations. In the 1790s they helped swell the number of protestors to 300,000. It was now popular to oppose slavery with pounds, shillings, and pence. Britain’s moral climate had changed. It took William Wilberforce twenty years to convince his fellow parliamentarians, but eventually, the strength of the argument won the day. In 1807, the House finally voted to abolish the slave trade – 283 votes to 16. And the House rose and cheered this hard-won victory, while William Wilberforce sat, with tears streaming down his face. But it wasn’t until 1833 – 26 years later, with Wilberforce on his deathbed – that the practice of slavery was finally banned throughout the British Empire. This story is a shining example of the love that Jesus called for – a love for neighbour, based on the dignity and value of every human life. And on this occasion at least, the beautiful tune that Jesus taught his followers was played clearly, wonderfully actually, and in a way that undoubtedly changed the world for the better. What does “freedom” mean to you? Do you think the church is concerned about freedom for the oppressed? What is something that you are passionate about? Why are you passionate about it? Share a time when you have persevered through difficult circumstances in order to reach a goal. Have you ever worn a wristband, ribbon, or something similar in support of a particular cause? If so, what cause (or causes) was it? Read this information from UNESCO about the Transatlantic Slave Trade, and look at this map of the slave route. Write down three pieces of information that stood out to you. 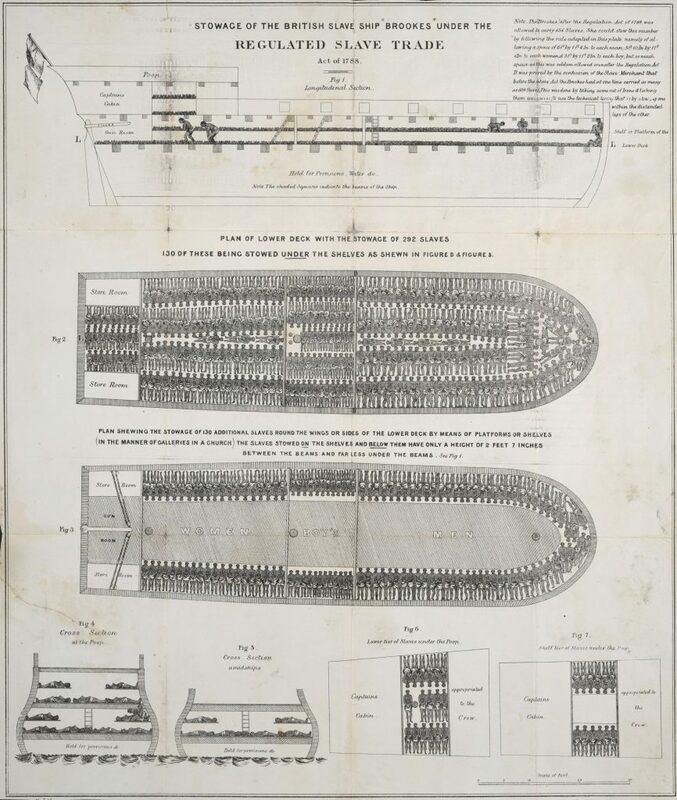 Look at this diagram of a British slave ship from c.1788. How does this image make you feel? Imagine you are a slave being transported from Africa to the Americas in the 1700s. Write a diary entry describing your experiences and feelings. Simon Smart describes William Wilberforce as someone whose Christian faith produced in him “a passionate commitment to action on behalf of others”. What were some of the causes Wilberforce and the “Clapham Sect” passionately worked for? What central conviction motivated Wilberforce to fight for the abolition of the slave trade? On what grounds was the opposition to Wilberforce’s campaign based? How might you have responded if you received this kind of opposition for twenty years? 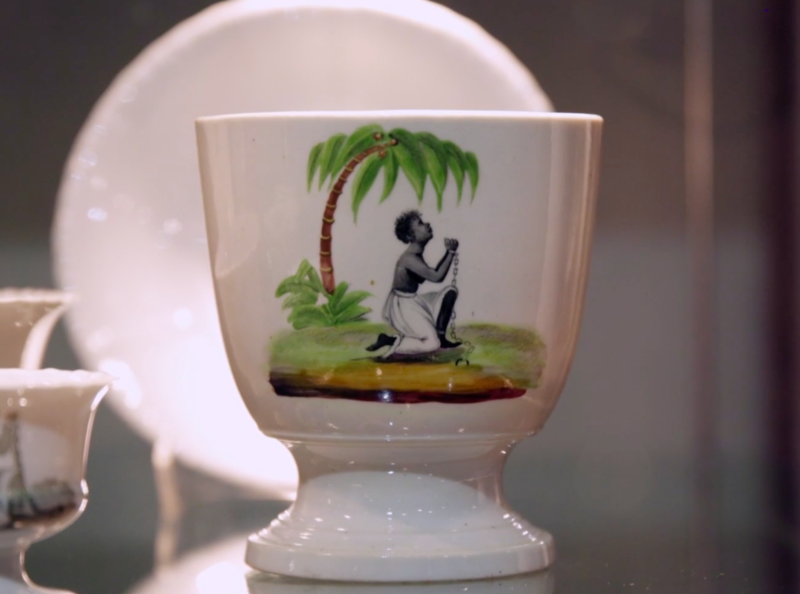 What strikes you about the Wedgwood bone china pattern referenced in the episode, and the words, “Am I not a man and a brother?” and “Am I not a woman and a sister?” Why do you think this was a powerful way to attack the slave trade? What particular role did women in Britain play in the abolition of the slave trade? Draw a picture of the moment when the slave trade was finally abolished by the House of Representatives, and Wilberforce’s reaction. How do you think you would have reacted if you were him at this moment? Rowan Williams describes the anti-slavery movement as being almost entirely run by Christians, and concludes, “If the abolition of slavery had been left to enlightened secularists in the 18th century, we’d still be waiting.” What is your reaction to this quote? Why do you think he says this? How important was freedom from oppression for Jesus? What does this verse call us to do? What reason does it give? What do you think the phrase “reap a harvest” means here? Rewrite this verse in your own words. How did William Wilberforce follow this verse? Read this information from the World Economic Forum about modern slavery. In small groups, inspired by the Wedgwood pattern, design your own product range and slogan to raise awareness about and fight against modern slavery. What would a modern-day William Wilberforce look like? What would be some of their defining characteristics? Write on a post-it note one thing you could personally do to promote equality of all and freedom from oppression in your school or community. Find as many Bible verses as you can that are referenced in the letter. Write a diary entry from Wilberforce after receiving this letter, reflecting on its contents. Find a recent news article about an example of modern slavery. Write a Facebook post sharing the article and commenting on it, drawing on themes from this lesson.